Mahalakshmi Temple is one amongst the oldest shrines of Mumbai. 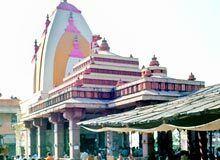 Located on B. Desai Road at Breach Candy in Mumbai, Mahalaxmi Mandir is the one of the most visited temples of the city. The temple is renowned for its exclusive history and devoutness. Sited at the seashore on the northern side of Malabar hills, Mahalakshmi temple can be reached easily by the means of local transport in Mumbai. The waves of the Arabian Sea impart a perfect background to this religious shrine of Mahalakshmi.